"JT USENI HAS SHORT MEMORY OR SOME PEOPLE HAVE FORGOTTEN THEIR HISTORY"
JT Useni The Military Man turn democrat has forgotten what he did to Ponfa Banda in Langtang North and Francis Kwarpo in Mangu, when they won chairmanship elections under CPC, Can he go to equity with clean hands? When did he become a democrat? During the Abacha era, there were political parties registered to kick-start return to civil rule. UNCP, DPN, CPC, PDM. 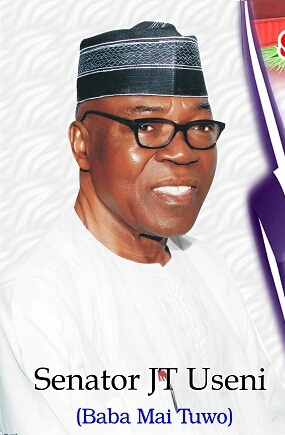 The late Ezekiel Yusuf was the state chairman of UNCP a party supported by the federal government and as FCT Minister, Useni was it's overseer. The CPC was chaired by Nicholas Selven Musa, with Chief SD Lar as leader. Local Government elections were conducted CPC won in Langtang North and Mangu LGA. But based on orders from Useni, the two were not sworn in, those of UNCP who lost were declared. The case went to the tribunal and judgement given in favor of CPC. Even then, it took time to execute. It's a case well known. So for Useni to vilify Lalong is just cheap talk. He was the first to introduce this type of thing to the state. Karma has a way of catching up with people and the evil that men do live with them these days. PDP and JT Use I have no moral right to question LALONG on whatsoever. PLATEAU PEOPLE SHOULD NOT BE DECIEVED,THE DEVIL YOU THINK YOU KNOW IN LALONG IS BETTER THAN THE UNHOLY ALLIANCE ANGEL S IN JT USENI AND JANG UNDEMOCRATIC ELEMENTS. JT Is not a Democrat and they are part of the problem that we face in Plateau Today. If you don't know where you are coming from you will never know where you are going. #KNOW YOU HISTORY PLATEAU CITIZENS,IT WILL HELP YOU SHAPE YOUR FUTURE.